This was my favourite day of the whole week. 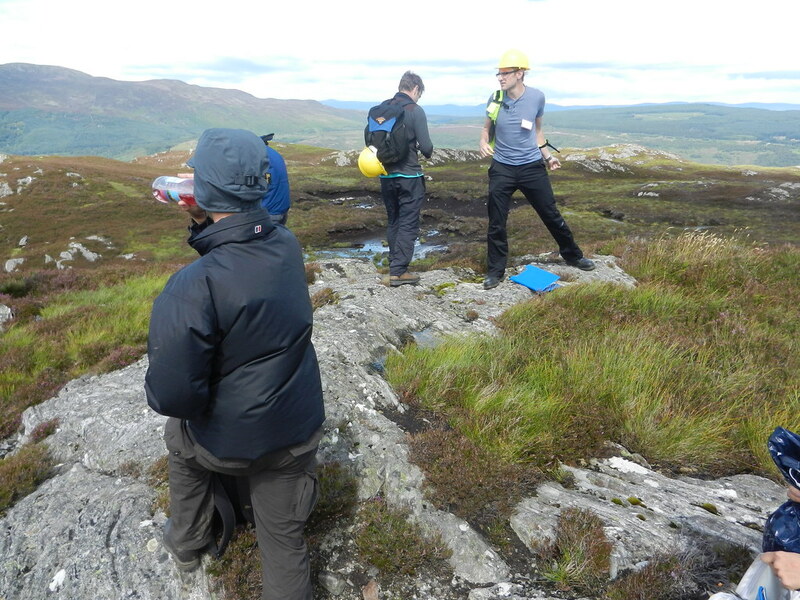 We had an area of Strath Fionan (just north of Aberfeldy) marked out with several locations, and we were off to investigate the changes in lithology and structure – with some proper hillwalking, even if it was just a short trek! The location was on the north side of the road from Schiehallion, but our hill was somewhat smaller. Schiehallion from the north side of the road. Schiehallion certainly looks fun for a walk, I’ve promised myself to come back with the dog and take it on. It’s also particularly interesting from a physics perspective, as it was used in an 18th century experiment to determine the mean density of the Earth. 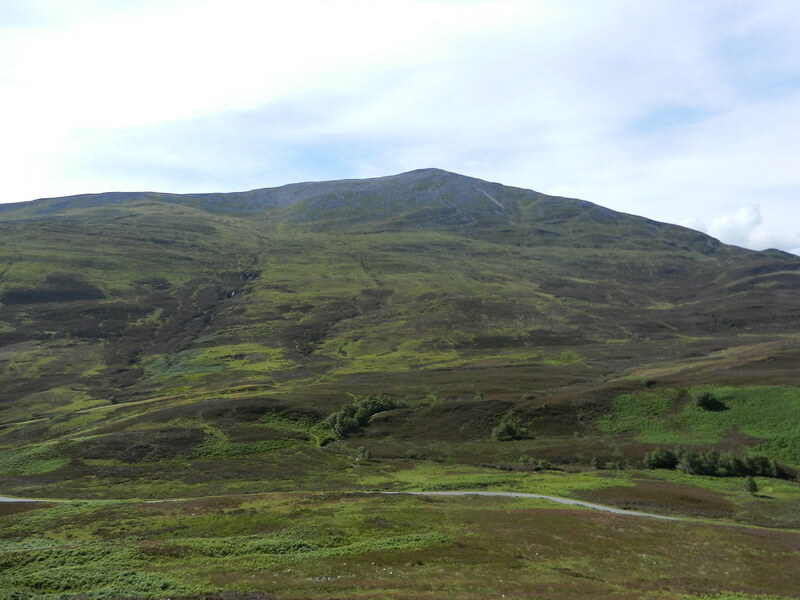 Schiehallion was the perfect candidate due to it’s symmetrical shape (not seen from this angle!) and its monomineralic lithology – pure quartzite. We climbed a bit further up to get a look at some of the quartzite on this side of the road and found some exposed amongst a patch of burnt heather. Stopping for a drink after the ascent amongst the burnt heather before studying the quartzite exposure in the background. After a drink, some field notes and sketches we were on the move again, heading north-west towards the top of the hill. 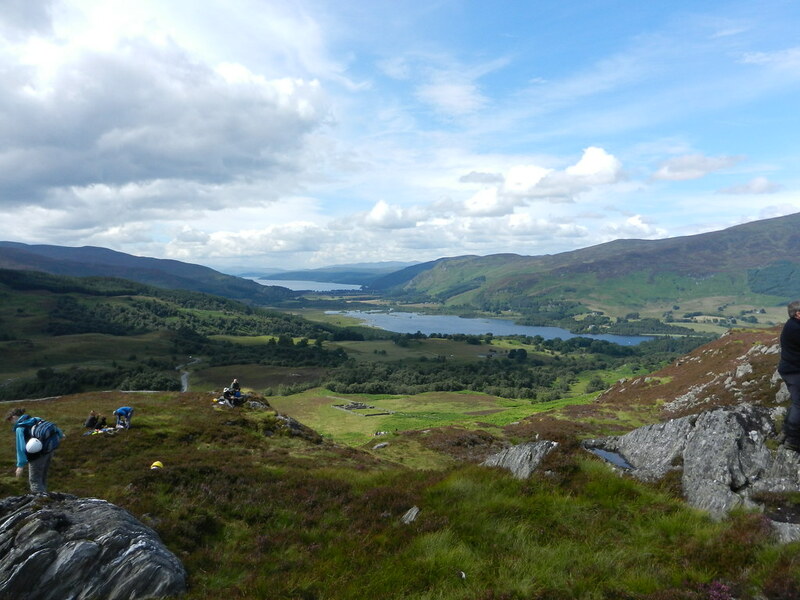 We were offered some stunning views of the lochs below. Lochan an Dáim, Dunalastair reservoir and Loch Rannoch in the distance. The marshy lochan to the left is Lochan an Dáim – our walk took us up to the ridge of the hill, where we walked along to see some more exposures before cutting back down this side of the slope further along, to cross back onto the road where it bends at the far end of the lochan. The water to the right in the middle of the image is the Dunalastair Reservoir, man-made and used by the hydro-electric power station downstream. 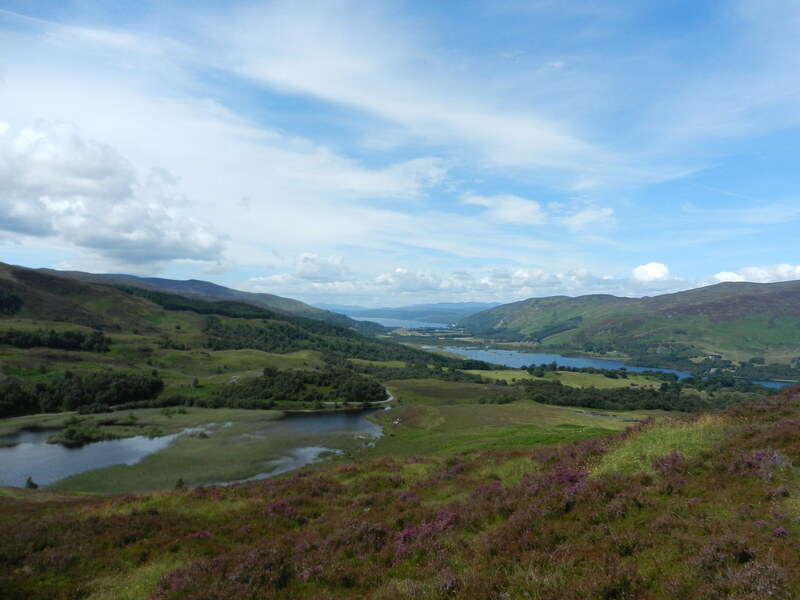 In the background the start of Loch Rannoch can be seen. It’s more easily visible in the next picture, when we got to the top! View from the top! Small ruins of a building / farm visible at the bottom of the hill near the centre. We stopped here for lunch, near the ridge at the top, and a few of us climbed the last part so we could see the views all around while eating. We found a great flat stone outcrop to use as a seat / table. The stone table at the top, where we had lunch. Now, we did come here to look at rocks, not just great landscapes, so after lunch we walked further along the top of the hill to see some great fold examples. 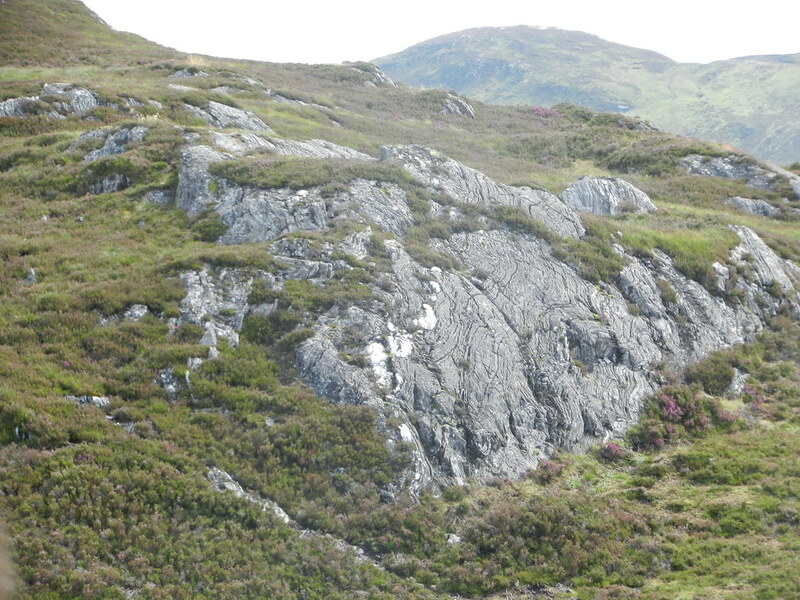 Folds in Dalradian metasediments, with quartz boudins running through the face. Cue lots of fun measuring dip and strike! We started to head back down the hill after following the trace of the quartz boudins for a while, and soon came to rocks with more upright folds. 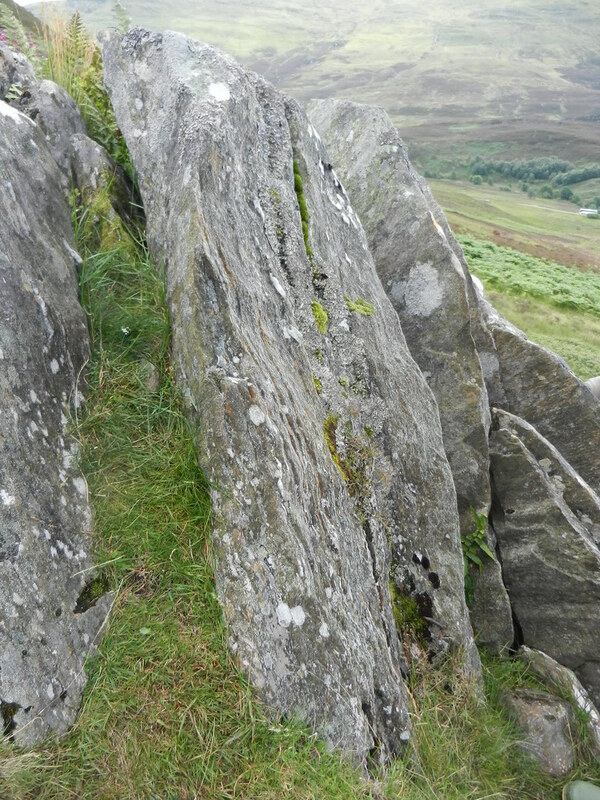 Crenulation cleavage on upturned schist beds. Here the schistosity has been folded, producing crenulation cleavage. 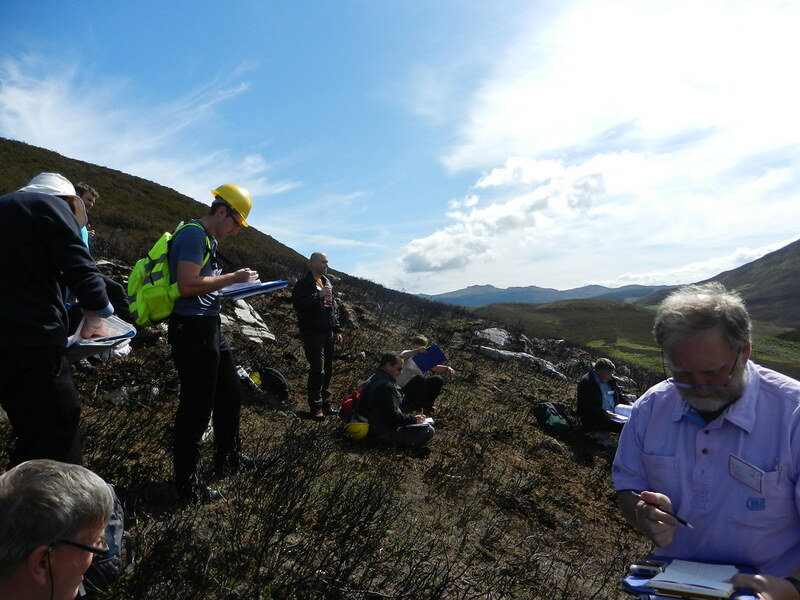 We headed further downhill to have a look at some amphibolite before making our way back to the main road. 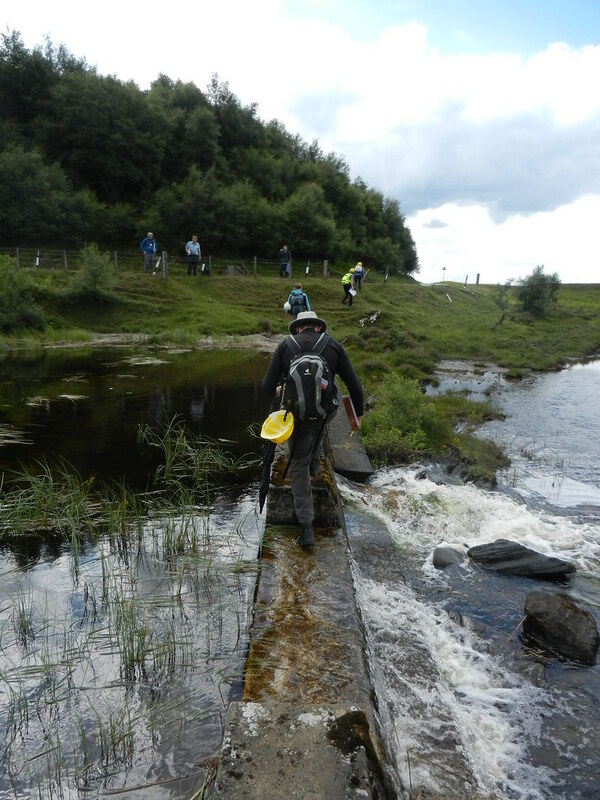 We crossed back over the ford at Lochan an Dáim to get back. Afterwards we stopped in Aberfeldy, a beautiful little town, unfortunately I left my camera on the bus so didn’t get any pictures! Had some lovely raspberry ripple ice cream though.